It's not hard to see why Keeneland race track was ranked number one out of the top ten tracks listed by the Horseplayers Association of America. For more than seven decades, this prestigious race track has encapsulated the true spirit of, and set the standard for, Thoroughbred racing. In 2015, Keeneland hosted the prestigious Breeders' Cup, one of the highlights of the international racing calendar. With the picturesque Bluegrass as a backdrop, the Keeneland racecourse transforms into a Mecca for bettors and breeders each year. Visitors to the track will enjoy premier Thoroughbred auctions, a sophisticated horse racing culture, and a level of resourcefulness that is hard to find anywhere else. But, it is their ceaseless dedication to the sport shared by patrons, jockeys, Thoroughbred owners, coaches, and track employees that ultimately makes Keeneland an authentic horse racing destination. Use our Keeneland schedule to stay up-to-date with all the stakes taking place this upcoming racing season. The Keeneland fall meet 2017 will once again set the scene for unforgettable track performances driven by velocity, agility, and spirit. Come place your bet and watch your favorite horses and their jockeys engage in a ferocious contest to the finish line, while excitement builds on the grandstands. If you're not planning to wager on the races, the Keeneland race track still provides an excellent opportunity to dress to the nines and socialize. The Keeneland opening Fall Stars Weekend will feature nine stakes, including the Group One Claiborne Breeders' Futurity, the Shadwell Turf Mile, Darley Alcibiades, and First Lady and Juddmonte Spinster. The prestigious Queen Elizabeth II Challenge Cup will be held on the second weekend in October. socialize. The turf track at Keeneland, installed in 1985, is a seven-and-a-half-furlong oval surface used for races of distances between five and a half furlongs to a mile and five eighths. The turf track comprises the Keeneland Course and the Haggin Course, which are used alternatively each race day to preserve the condition of the turf course. Why not take a guided walking tour of Keeneland's beautifully landscaped grounds? Learn about the history of the track, get inside information about races and sales, and visit the Keeneland Paddock, Grandstand, and world-renowned Sales Pavilion. You can also enter Keeneland Library, one of the largest information centers about Thoroughbred racing in the world. Keeneland tours last one hour and tickets cost $8 per person and are free for children 12 and under. Exclusive Backstretch tours for $25 are also available and feature a scenic walk through the barn area, trackside view of morning workouts, and horses being bathed and groomed. You'll also stop at the Racing Office and take a look at the Jockeys Quarters. Backstretch tours start at 8.30am, last two hours, and are limited to groups of 14 people. All Keeneland tour tickets can be purchased online or at the Keeneland welcome center, see the full tour schedule. The turf track at Keeneland, installed in 1985, is a seven and one-half furlong oval surface used for races of distances between 5 ½ furlongs to a mile and five eights. The turf track comprises the Keeneland Course and the Haggin Course, which are used alternatingly each race day to preserve the condition of the turf course. The Keeneland race track is listed on the National Register of Historic Places and declared a National Historic Landmark in 1986. Over the course of 70 years, Keeneland has grown to become the front-runner in the horse racing industry with regards to track safety and innovation. They became the first track to install a Visumatic Timer (a system that posted fractions and final times on the tote board) and the first track in Kentucky to use an electronic totalizator system for buying and cashing tickets. 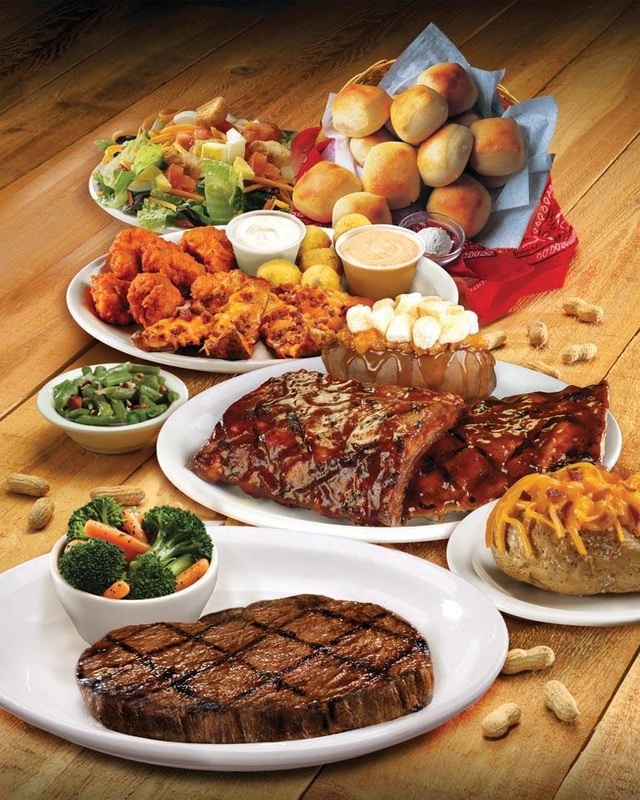 For hand-cut steaks, fall-off-the-bone ribs, ice cold beer and a legendary good time look no further than Texas Roadhouse! You’ll find a lively atmosphere, made-from-scratch sides, bottomless peanuts and endless fresh-baked bread at two Lexington locations on Richmond Road and Lake Crest Circle. A full-time butcher cuts each steak by hand and you can pick the one you want before you even sit down. In fact, Texas Roadhouse handcrafts almost everything on the menu. And if you want an ice-cold beer or legendary margarita to wash it all down — you’ve come to the right place!